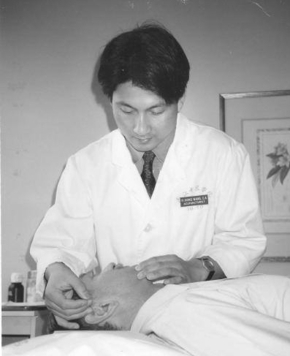 Dr. Wang teaching acupuncture in 1992. Acupuncture is a natural medical art developed a long time before the days of microscopes, x-rays, electrocardiographs, and biochemical analysis. It has been practiced for over 3,000 years and is widely used by one quarter of the world's population. Each part of the human body has its own characteristic way of warning us when something is wrong. Pain, swelling, increased temperature, vomiting, bleeding, fatigue, constipation, depression, weakness, paralysis, and paresthesia are some of the warnings which we recognize as symptoms of disease. Acupuncturists see all of these symptoms as indications that the energy-transmission system of the body is malfunctioning. They attempt to correct the malfunction by inserting very fine needles at specific acupoints, which they expect will send a message of stimulation or sedation to the organ or system causing the malfunction responsible for these undesirable symptoms. • Gastrointestinal Disorders: food allergies, peptic ulcer, constipation, diarrhea, indigestion, gastrointestinal weakness, anorexia, and gastritis. • Urogenital Disorders: stress incontinence, sexual dysfunction, and urinary tract infections. • Gynecological Disorders: irregular, heavy, or painful menstruation; infertility in women and men; and PMS. • Respiratory Disorders: emphysema, sinusitis, asthma, allergies, and bronchitis. • Bone, Muscle, Joint, and Nervous System Disorders: arthritis, neuralgia, migraines, insomnia, dizziness, and pain of the lower back, neck, and shoulders. • Circulatory Disorders: hypertension, angina pectoris, arteriosclerosis, and anemia. • Emotional and Psychological Disorders: depression and anxiety. • Addictions: alcohol, nicotine, and drugs. • Eye, ear, nose and throat disorders. • Supportive therapy for many other chronic and painful debilitating disorders. Tuina (pronounced "twee-nah") is a form of Oriental bodywork used in China for more than 2,500 years. Tuina has been gaining international attention for its safe and effective treatment of a wide variety of conditions. Practitioners use their fingers, hands, and/or elbows to apply pressure at a specific body meridian or acupressure point in order to remove the blockages preventing a free flow of qi. Removing these blockages restores the balance of qi in the body, leading to improved health and vitality. Tuina is best suited for rectifying chronic pain, musculoskeletal conditions, and stress-related disorders that affect the digestive and/or respiratory systems. Among the ailments tuina treats best are neck pain, shoulder pain, back pain, and sciatica. However, because tuina is designed to improve and restore the flow of qi, treatments often end up leading to improvements in the whole body, not just the specific area being treated. There is also anecdotal evidence that headaches, constipation, premenstrual symptoms, and some emotional problems may also be effectively treated with tuina.